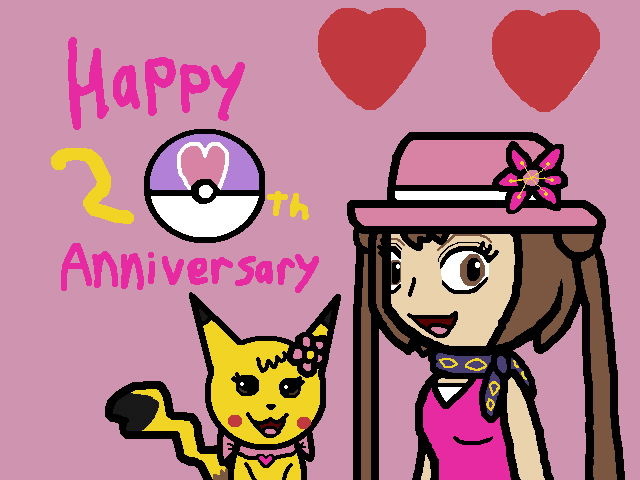 I drew a pic of me, Chelsea, a Pokemon Trainer, and my Pikachu named Amy to celebrate the 20th Anniversary of Pokemon. I know Pokemon Red, Blue, Green, and Yellow are out now on the Virtual Console on Nintendo eShop, and I'm planning on getting Pokemon: Yellow Version, but I don't have enough money right now, but I'll get it eventually. This picture is drawn on Painting Workshop. Yayssss! Nintendo is doing pretty well with the Pokemon Franchise. I am also looking forward to sun and moon. Let's celebrate together x3!!!! Also can't wait for Pokemon Sun and Moon either! Thanks, and thanks for the fave!